Google yesterday announced plans to introduce phone-finder service Android Device Manager “later this month,” but it has already begun rolling out to some devices this weekend via a Google Play Services update. Android Device Manger, which will comprise of a website and Android app, will allow users to locate their device by making it ring to the maximum volume (even when on silent), while its location can be pinpointed in real-time on a map, helping hunt it down if it is lost. 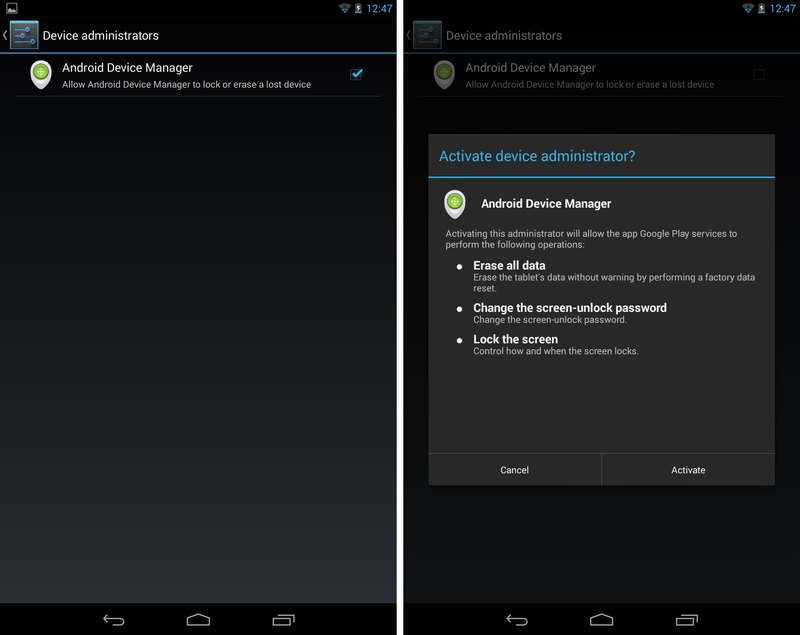 A selection of Android device owners on Reddit are already claiming to see the new option within their device management settings, as Android Police reports. The Play Services update is still making its way to all Android devices, while the standalone Device Manager app and its Web interface have not yet launched. Nonetheless, early screenshots show that users will be able to change their screen lock password and remote lock the screen remotely, as well as erasing all data via Device Manager. That’s interesting because remote lock is a feature that Google didn’t mention in its announcement post, which merely says “you can quickly and securely erase all of the data on your device” if it falls into the wrong hands. Erasing all data is a move that is not to be taken lightly, since it is not reversible. That makes the option to lock a device particularly welcome — although exact details of what that would entail and how secure it would be are still to emerge. The Device Manager service will function much like Apple’s Find my iPhone service and Microsoft’s Find my (Windows) phone solution. That void is currently filled by third-party apps and services that device makers have developed themselves. For example, Sony set up my Xperia to enable its customers to switch on the ringer remotely to locate their device, or lock and wipe it in the event that it is lost or stolen. My Xperia has been in beta since January, but it is expected to be made available to all of Sony’s 2012/2013-released devices by the end of the year. The new version of Play Services also includes a ‘Compass Mode’, which lets users navigate photo spheres using their device and its onboard compass.